Following yesterday's post on Brooklyn's Yeasayer, we stay in the same geographic area for a little post on Santi White, aka Santogold. Miss Gold has been receiving mega hype of late, a result of her debut eponymous album leaking on the internet. That album is out on May 12th in the UK (and she's touring too), by the by. Not that she's a particularly new sensation, with internet fandom late last year and an appearance on Mark Ronson's 'Versions' album covering The Jam. She's even written and produced hit US R&B singles. But she's moved away from R&B really and comparisons to MIA are inevitable. A simple conclusion would be that she's the electro pop MIA. 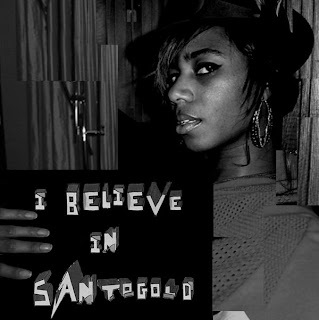 But it's difficult to pigeon hole Santogold with her tracks displaying an array of influences, admittedly largely from the 80s. I guess it's this diversity that will allow Santogold to emerge from MIA's shadow, as an artist in her own right. But maybe that's being a bit presumptive, what do you think? Listen to recent single 'L.E.S Artistes' as performed on BBC TV show, Later With Jools Holland yesterday. It's out this week in the UK as a single. Seeing as I didn't manage to get a podcast out for April, if you're looking for a bit of podcast action, you could do no worse than to catch KHI podcast#3. It expires in a couple of weeks time or so, and features Johnny Foreigner, Miracle Fortress and other randomly put together tracks that were pretty good to these ears. Listen then download [here]. A May 2008 podcast but the best way to keep abreast of such things is to subscribe to my RSS feed/s - look in the sidebar on the right hand side of your screen for my podcast only feed or my feed for podcast and blog posts. Otherwise, feel free to check back every so often!